Friday morning, I woke up feeling like I had slept more hours but they were just as crappy. I just wanted to burrow under the covers for a few more hours. But I dragged myself out of bed and got ready for work. Since I was feeling crappy, I wore my newest skirt and my most comfortable boots to work. Fake it ’til you make it right? 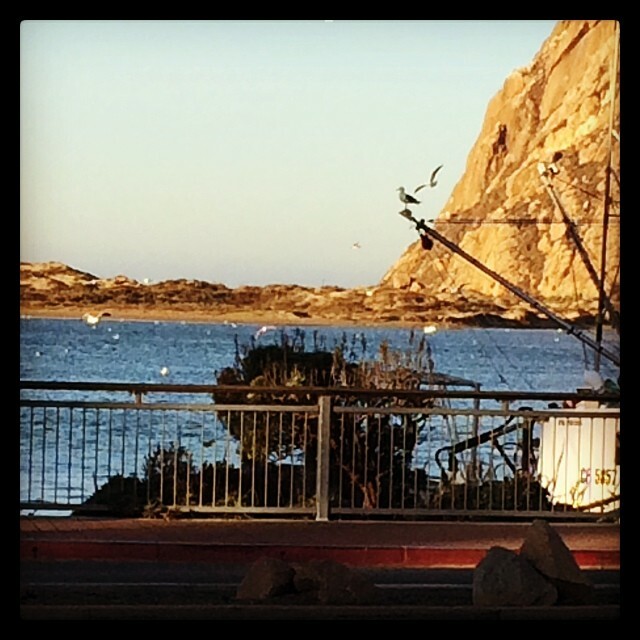 The seagulls were going crazy! Shaping up to be a good day, right? By early afternoon, my headache had turned into a head pounder and my swallowing was so painful. Ahhhh, light bulb moment, I was sick. Maybe that explained the week of crappy sleep and the zoning out I did a few times at night. I watched Biggest Loser on my DVR over the week, but I couldn’t tell you a dang thing that happened. I don’t remember it at all. 😦 After leaving work yesterday, I crashed in the Comfy chair with a blanket. I was hoping I would be better in time for a long run today. She then needed to head to the Tennis Warehouse to pick up a few things for the team. Uhoh- danger zone! The Running Warehouse was literally 10 feet away. And I had been feeling the urge for new shoes. I was one of those rare runners who only had one pair of shoes. I wore them for every race, training run and occasional trail adventure. When they wore out, I replaced them. With my planned increase in training this spring and more half marathons on the schedule as well I was thinking about getting another pair. The place was packed, but then the store front is small. However customer service there is amazing. I tried to resist, I really did. 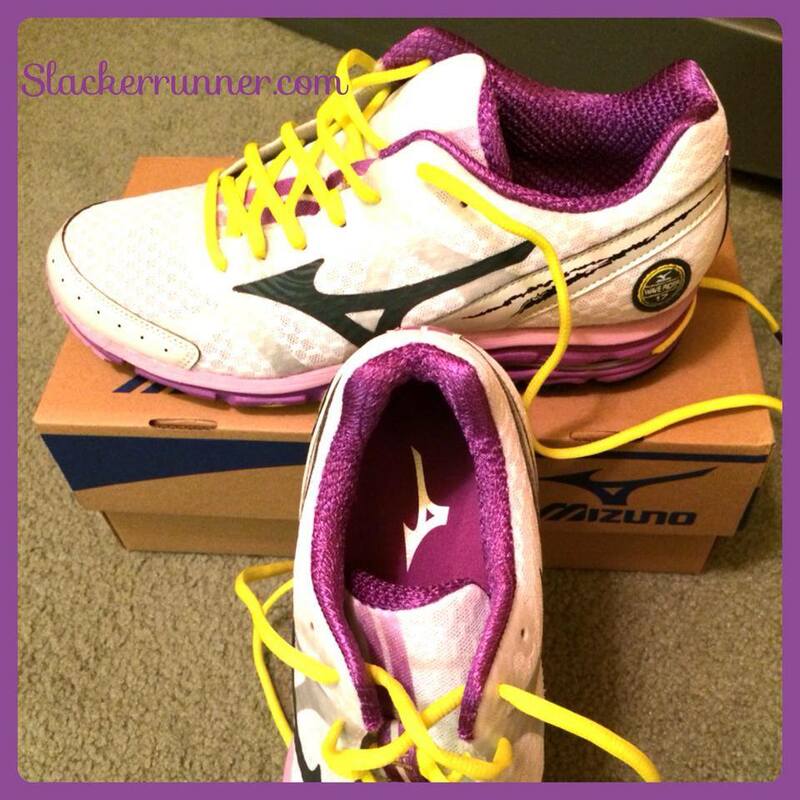 I ended up trying on the Mizuno Wave Inspire 10 and the Mizuno Wave Rider 17. I love my current pair of Inspire 9’s so I was optimistic for the 10’s. They felt like an entirely different shoe, tighter and flatter. Not cool. The Wave Rider’s on the other hand felt awesome! Restraint be damned! Was I really the only one with one pair of shoes? Thanks, I hope your race went well! Hope you feel better soon…. Love new trainers! 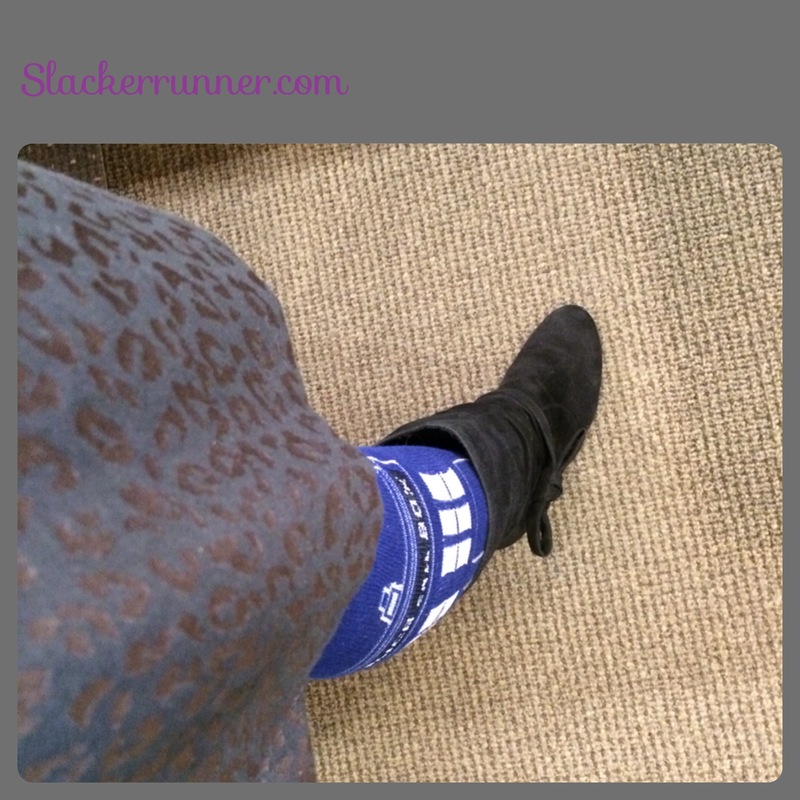 Love the Tardis socks! You’re not the only one with 1 pair of shoes. I have only one pair too. Hope you get your run in! I’m sick too, and yesterday I thought I might get 4-5 miles in today. Now, I’m not sure I’ll get out at all. Maybe a trudge on the treadmill. I am a Wave Rider girl myself–hope you like them too! No, I have several pairs of shoes. One Wave Rider 15 for everyday training and a pair of 16s for races, since they’re lighter and have less day-to-day wear. Yay TARDIS socks!!! And how disappointing about the Inspire 10’s! That’s the shoe that I wear (the 9’s) and will need a new pair somewhere around March and was looking forward to seeing what changes they’ve made. I wonder if I’ll think the same thing. I will wear one pair of shoes for 6 months, then get another. I don’t rotate. It’s only recently that I actually now have specific shoes – I now own 1 pair for road running (Mizuno Wave Inspire 9’s), 1 pair for weight training (Reebok Crossfit Nano 2.0’s) and 1 pair for trail running (Reebok Outdoor Wilds). It’s awesome having the specialized shoes and not destroying my plain ol’ running shoes. I was pretty bummed out, I was hoping they would be as awesome as the 9’s, Maybe it is just my weird feet but I didn’t feel any arch support at all. The Wave Rider’s felt amazing so hopefully they will be just as nice running. One of these days I will buy a pair of trail shoes. Hopefully! I hope that you get to feeling better soon! Once I get over this chest infection, my son said he wants to start running with me, so I’ll start the Couch to 5k training program over and do it with him. I’m really excited about his interest! Ugh, doesn’t being sick bite? Hope you’re feeling better too. That’s great, it’s awesome to have a running buddy! I wish I had started at his age than when I did, it was so hard!